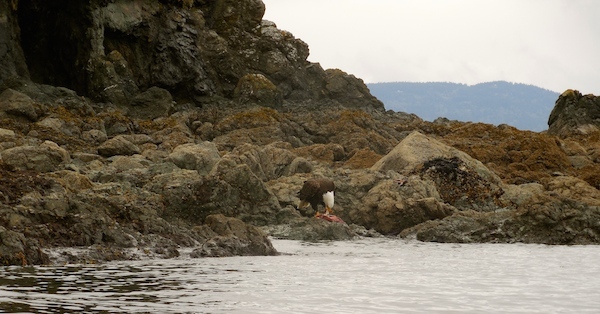 Author note: If you just want to watch raw videos of a Bald Eagle eating an Octopus and another where an Eagle talks to his friends (with his mouth full), scroll and click. If you want some perspective, read first. Then, click. Saturday, April 26, 2014 – Lummi Nation – Launching from Gooseberry Point on the Lummi Peninsula, my destination was Clark Island. I had prepared for the trip by timing the direction of the currents to make my crossing of the Strait of Georgia to Clark a bit easier- and the return journey as well. I was on a schedule, but had chosen to push the time to cross the open water in a narrower window (I hit the snooze- a couple times). Leaving the beach at the ferry landing, I had a light wind at my back and the current running my way. “Yeehaw”, I exclaimed out-loud as the energy of the tidal current flowed from stern to stem underneath my trusted steed (Delta 17) propelling me toward my first waypoint- Point Migley. About to cross a major shipping channel and enter into open waters of the Salish Sea, I came close to shore for a Safety Break. As I looked for a convenient (out of the wind) spot to stop I rounded a small outcrop of rocks and looked to the shoreline. What I saw in front of me was amazing. There was this big Bald Eagle with a fresh catch- right there! I sat still (as I can in a kayak) and employed my nature watching theory: DON’T LOOK AT THEM. Please, let me expound. The dark lenses of my glasses make my “eyes” more evident for wildlife as landmarks on my face. I figure, if I’m not looking at them, I must not be interested- or more importantly, not hungry for them as potential prey. Instead, I look out of the corner of my eye, as I seemingly scan the rest of the horizon- feigning disinterest and going about my own business. This approach seemed to be working as “the bird” (understatement) ripped apart the fresh catch of the day right in front of me. I pulled my Nikon PHD (Push Here Dummy) out of my paddle jacket pocket and snapped my first photo. The added challenge (not tipping over) was holding the camera at my side, shooting at an angle- as I kept the lenses of my sunglasses pointing away from “the bird” and north to Boundary Bay (it’s actually a body of water). The catch was fresh and as “the bird” sat by the water’s edge, I wasn’t sure what was being served. I was committed to capture (the image) so I couldn’t look directly at the subject. I pushed the record button. I would liked to have stayed there and watch, but I had a channel to cross and time was of the essence. But before I left, I pushed record one last time. First, you’ll hear the Bald Eagles sitting in the tree above and then witness the response of our friend, “the bird”. Enjoy. Look for more complete story of the day’s journey in the 2014 Spring/Summer issue of Mt. Baker Experience. If Seagulls fly over the sea, what flies over the Bay?